Agile thinking empowers people to be knowledge workers, to design the work and make the decisions. It treats them like they are over 18 and on the same side. Conventional IT and especially IT management treats people like clerical workers, like plug-compatible wetware, like Human Resources, who can't be trusted, who are evaluated numerically, who are an overhead to be minimised, who need to be told what to do and how to do it. Which one is more condusive to satisfaction and mental health? How do we get there? Trying to change culture and work directly is futile. It works at a team level up to a point, if you can create enough whitespace for change to survive. But beyond that point, change must be systemic. And fairly soon it must be systemic at an enterprise level. Change the way we manage work, in order to change the system of work, to change the way we work. Trying to "make work agile" is futile. New Ways Of Managing honours the principle Damon Edwards taught us: you can't change a complex system, you can only create the conditions for it to change itself. Management creates and manipulates those conditions. 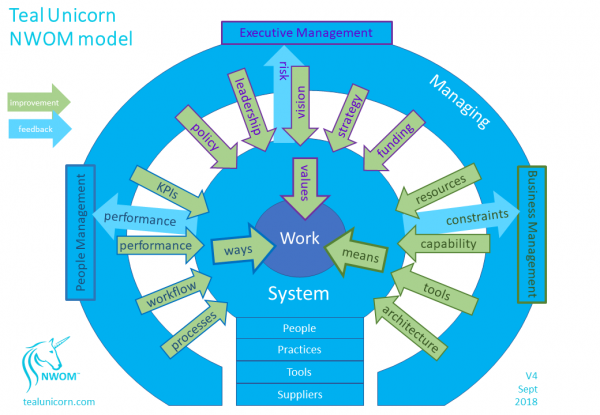 New Ways Of Managing also honours the Agile principle of "Let the people doing the work design the work". The system gives them the values, ways, and means, and lets the work be emergent. It is almost never the individual. Unreasonable systems make unreasonable people. Fix the system. Staff get labelled as lazy, negative, obstructive, when they're actually frustrated, bitter, disengaged, tired, afraid, unsafe. Most blossom when you get the system off them. Nor is it the process that is the problem. Trying to improve a process is like fixing one cog in a gearbox. Even if you overcome that analogy by making a process more efficient, effective, and usually easier, that will often be a local optimum which degrades the system flow. And of course improving tools never fixed anything, in isolation. Tools come last. Improve the system to free the people to improve the processes to identify tool requirements. So long as the organisation is in an explore mode, you can do everything grassroots. But in order to move to The New Way Of Working (read: Managing) For Our Org, you need executive support: a mandate to incubate that new way and adopt it widely in an iterative incremental manner. (I should define management. I'm throwing a broad net to include the executive and maybe even governance, as well as HR management and work management.